The tornado watch for the D.C. area has expired, but a coastal flood advisory remains in effect for southern Maryland through 1 a.m. Tuesday. Heavy rain and wind pounded the region around midday Monday, prompting now-expired tornado and severe thunderstorm warnings for Stafford and Spotsylvania counties, and Fredericksburg, Va., and a tornado watch for much of the capital area. In Prince George's County, after-school and evening activities were cancelled for students. After-care will be provided as planned. Massive Tree Branch Lands on Car in Northeast D.C.
A massive tree branch fell on a car near Lincoln Park in northeast D.C. Monday. 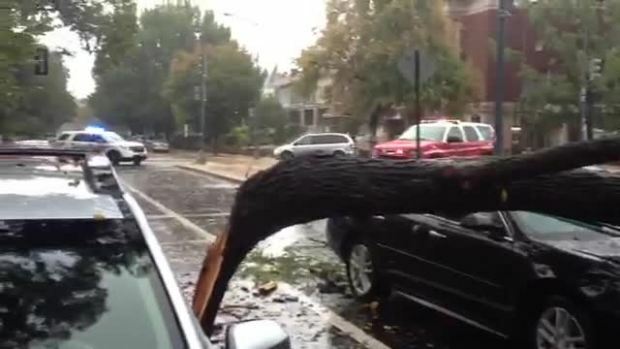 On Capitol Hill, wind gusts slammed a massive branch onto the hood of a car. The owner told News4's Tom Sherwood that leaves started falling around their car and he didn't even realize what was happening at first. He and his girlfriend were able to get out of the vehicle and weren't hurt. Heavy rain and wind gusts up to 75 mph remain possible during the day Monday. A line of thunderstorms moving through the region produced damaging winds and heavy rain, and created the possibility of tornadoes, said Storm Team4 meteorologist Tom Kierein. A tornado watch means conditions are favorable for one to form; a warning means one has been detected. 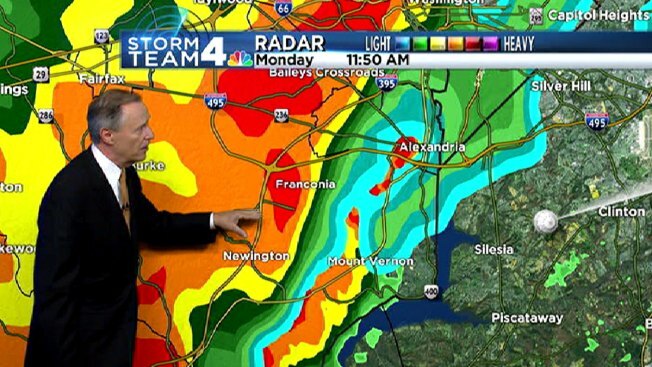 Heavy rain moved east across the region and reached the district by noon Monday. The front should reach southern Maryland by 8 p.m., taking the rain and storm threat along with it. There are reports of flooding in parts of Loudoun County and areas east of the Blue Ridge, Kierein said, including in the area of the Dulles Greenway. Authorities warned drivers to be careful, especially in the eastbound lanes of Route 7 to East Market Street. Rainfall amounts will average around one inch, but local amounts in excess of two inches will be possible. An earlier tornado warning for the panhandle of West Virginia has been canceled. After the front passes through, clear October weather will return. By dawn Tuesday, we'll see temperatures in the low 50s, as well as autumnal temperatures for the rest of the week.